National’s 2012 budget focused on cutbacks and reducing government debt. The budget increased research and healthcare spending through cuts to KiwiSaver, Working For Families, the public sector, and the education system. Cutbacks in the public sector are a basis for casualisation, with contractors profiting by undermining labour conditions (public sector cuts will be covered in more detail in the August issue of The Spark). Attacks on financial assistance have served to scapegoat beneficiaries, workers and students. These cuts have generated resistance in some sectors, with particularly sharp confrontations in tertiary education. Fight back will need to be consciously broadened to challenge the system which produced this crisis. National is mystifying the situation by not distinguishing between government and private debt. Treasury reported that of this country’s national debt, most borrowing has been undertaken by the private sector. Although government borrowing has increased since the crisis and the tax cuts, government debt makes up 33.7% of GDP. By contrast, private debt makes up 166% of GDP, with housing loans making up 90% of private debt. Private debt has increased because income does not cover prices. Real wages (wages relative to the price of commodities) have fallen 25% in the last 30 years while productivity has increased 83%. Rather than investing in research and development, successive Labour and National governments have increased labour productivity by working people harder for less. This rising rate of exploitation leaves a shortfall in savings, requiring the extension of credit. Although this contradiction has not reached the point it did in the US, it is the main factor driving national debt. Increasing income would address private debt, and improve most people’s lives. Neither option would suit the National Party’s corporate backers. Instead, National prefers to mystify the problem, scapegoating those who require state assistance. Cutting back assistance will only increase personal debt. National is largely treating public education as an inconvenient expense, but there are promising signs of fightback. When Education Minister Hekia Parata announced a policy of increasing class sizes, a resounding outcry from parents and teachers forced the government to back down. However, Education Minister Hekia Parata has announced that she will be making cuts of up to $174 million elsewhere in education to make up for it. Tertiary reforms cut back access to financial support. Most absurdly, the Student Allowance was cut entirely for post-graduate students, a glaring contradiction when government funding is based on producing research. Many students will now be unable to participate in post-graduate research. The government also increased loan repayments, although student loans make up only 6% of private debt. 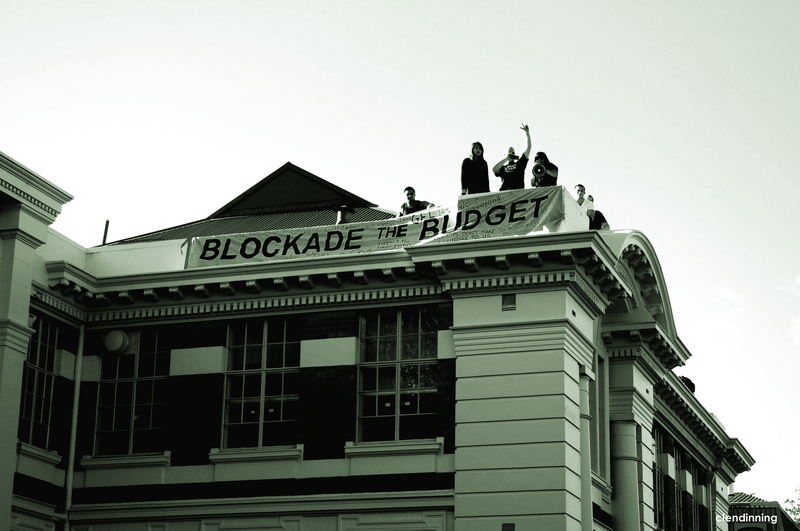 On budget day in Auckland, We Are The University (WATU) blockaded the streets under the slogan “Blockade The Budget.” Finance Minister Bill English provocatively commented that students “need some Greeks to show them how to do it,” and WATU responded by calling on students to “Protest Like The Greeks” the following week. The state clamped down hard. Video footage caught acts of clear police brutality against non-violent students. Many of the students were arrested and released without charge. The student movement is relatively isolated, partly because many teachers at universities are cowed out of taking action – although teachers in primary and secondary education are more militant. University students will need to develop links of solidarity with other sectors; with teachers, workers, beneficiaries. We need to think and act strategically to confront this system, which indebts then blames the majority. 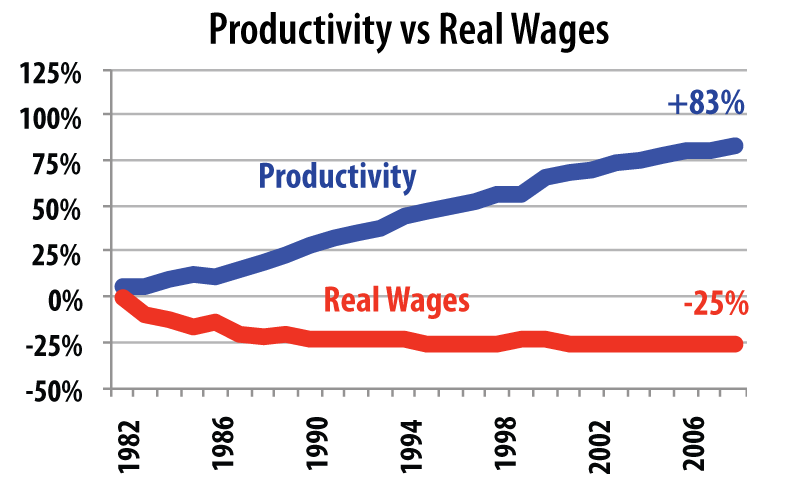 Excellent graph of productivity v wages. Yeah, it’s from Treen’s pamphlet linked above. Says a lot. I don’t think you people get it. If you want change you must make the current system fail. i have done some martial arts and one thing is if some one grabs your arm and pulls you towards them you don’t pull back all that results from this if they are stronger is for you to be dragged screaming in the direction they want you with them in control as seen in the video. If some one grabs your hand and pull you you move in their direction rapidly and bring you elbow up to their throat and your other hand behind their back. the result is you have moved in their direction but they are now on the ground and you are walking over them. read the last paragraph of this article, what John Key is saying is that they have done every thing they can do easily but nothing works so encourage them to do more push everything to an extreme. No unions, no welfare, no public schools, elite universities and no public health and even then their system will collapse. Every thing they want will kill them. Every time you resist you get a compromise just the compromise is a teaser but because you gain something people feel happy again even as they get screwed harder. So you use what you have. We have a large private debt it is in the interests of those at the top to allow us to make the payments each week if you encourage the sale of assets and further user pays compounded with wage growth restrictions through removal of unions and worker rights the system will fail. you need to see your productivity graph become more extreme and foriegn ownership along with government spending cuts would achieve this. The country won’t look pretty at this point and boat loads of refugees might be leaving the country and starving dying in the streets but at the point of collapse if you are ready or able you will beable to put in any system you want as long as it doesn’t start with a capital C.
Personally I think you are looking at corporatism not capitalism as your enemy but I might be at the wrong website. Ross, that is not going to work and whom ever actually follows that advice will be seen as some sort of weird doom cult. You have a pretty narrow and determinist take on how these contradictions are resolved. Part of which involves no agency on behalf of the workers. If you look at something like the great depression, it wasn’t till 3-5 years that you saw a fightback, in part that was a partial response to the crisis bottoming out and even starting to look a little more positive. The doom cults are those you apparently fight against. Zero sum corporate capitalist’s who gather all the wealth, that becomes a death spiral but just as it spirals out of control workers flex their power which drags the cult back from it’s death. The elite can see the result so they give a little back spread the wealth a bit and at this point the workers rejoice go buy a new TV open a beer pay the mortgage and give up. There is a reason Arabic countries had revolutions the people had gone past the point where their governing powers could hand out a few freebees and this is why most of europe, America and New Zealand are not in the mood for revolution. Even Greece is not about revolution just a return to what was, the people miss the money that the government was borrowing and spending most don’t want something new they miss the old. The revolutions in europe will occur when the economy and demographics put them past the point of no return. So this why I suggest you give up fighting and move in the direction that they want to go passively or actively and when production goes up but wages go down, debt spirals up and wealth accumulates at the top just keep urging them on. this publication already advocates freemarket policies with the idea of open borders for workers so why not go for broke and remove the minimum wage, welfare state and labour laws and watch your production/wage graph go to hell. You look now the politicians have no ideas they never thought about the losers in a freemarket system and never contemplated that they may be leading a losing country. Even now they are in a more socialist mode with things like the broadband roll out and road construction being code for job creation schemes. As thing get worse their only ideas will be more of the same but harder like they do with crime. More cuts and more cuts that is all they have, that and a police force and army. In the end even john key might become a socialist.